Monastic clothing. Franciscan Brothers in 19th century. Home » Monastic clothing. 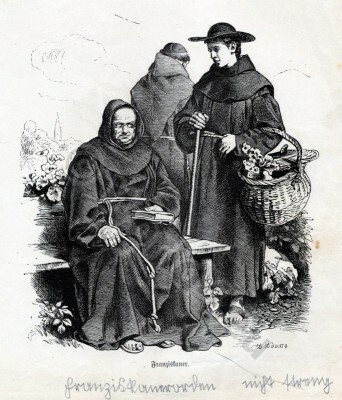 Franciscan Brothers in 19th century. Franciscan Brothers, monks in 1870, 19th century. Monastic clothing. Costumes of Religious Orders. The Rise of Monachism. Monastic costumes history. On the history of costumes. From Ancient to the 19th century. This entry was posted in 1780, 18th Century, Ecclesiastical and tagged Ecclesiastical Dress, Monastic clothing on 4/4/13 by world4.